That’s how many it took to get a coat pattern to fit Mr S the way I thought it should. 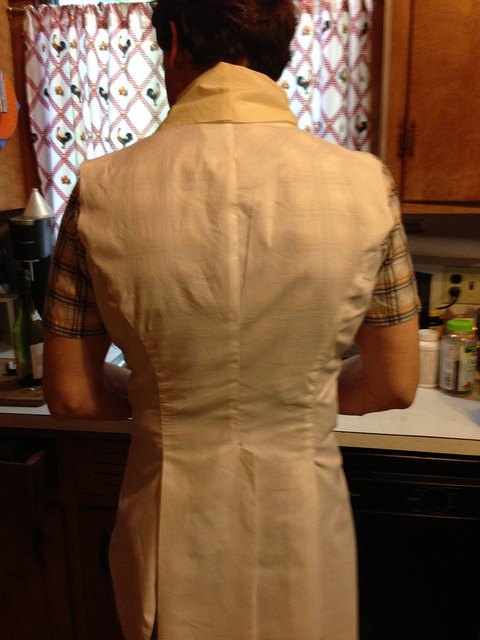 I finally built the pattern around a sleeve and arm scye that I knew worked and suited the period. 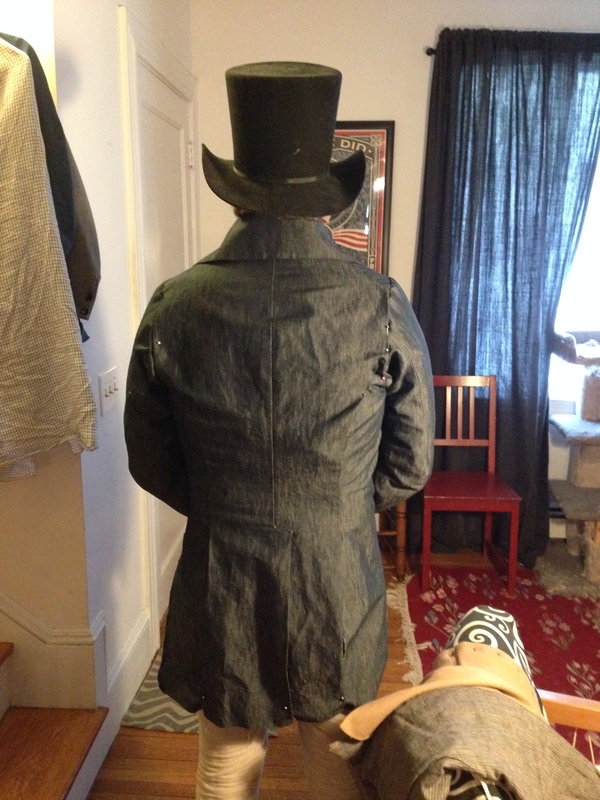 From there, I built out the back, altering the center back seam curve to suit Mr S’s figure. Arm scyes are still hard for me to figure out, although sleeves are often my favorite part of a garment. I like how flat pieces become three dimensional in a sleeve, and I enjoy setting sleeves– go figure. Thanks to the three-day holiday weekend and sitting out a parade to pad stitch, I have a coat body. I’m not thrilled about the size of the lapels, though I have found extant examples and fashion plates showing lapels this size, and sleeves, too. While I’ve pinned up the sleeves in the back, thinking there’s too much fabric there, I can also see from the images that the subject’s posture was not the best– and that was the moment when I realized that I really did want a mannequin for menswear as the subjects are hard to catch at any age, and variable in posture and wiggliness. They also object to being pinned accidentally. But there is at least a coat body on the way to being done, so I took a break and made a bonnet, which is really the point here <ahem> milliner’s, not tailor’s, shop, after all. Pasteboard brim, blue silk taffeta lined with white silk taffeta (they had new things at the fabric store, very exciting! 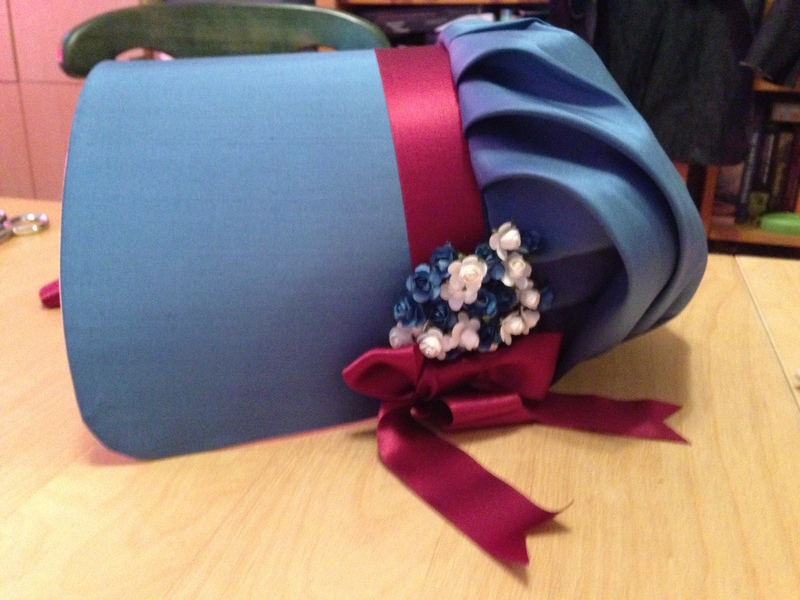 ), trimmed with silk ribbon from Wm Booth and paper flowers from the V&A. I found your blog very interesting ! I learn a lot. 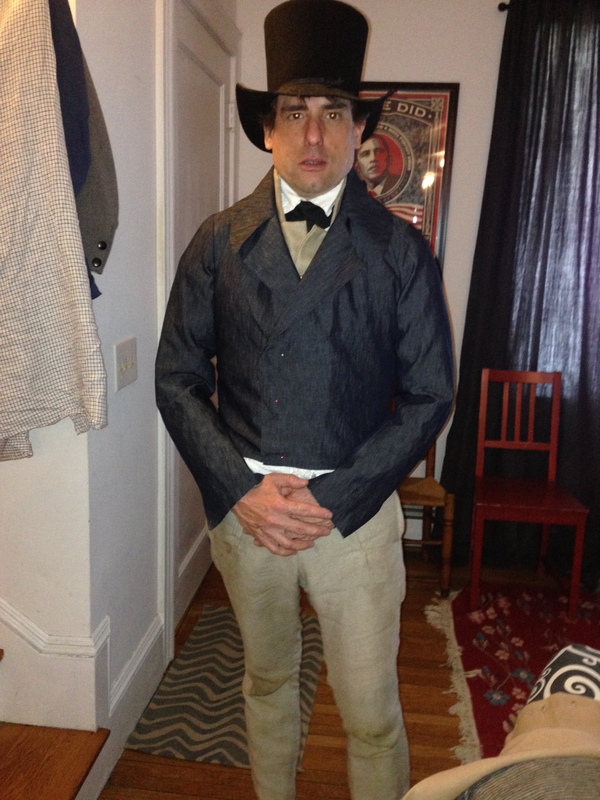 I’m sewing a costume 1800 for my friend and I love the hat of Mr S ! Have you made it or bought it ? I would love to offer the same to my friend ! I wish you a Merry Christmas ! Mr S’s hat was purchased from a friend who makes them here in the States. You can DM me at kittycalash (at) gmail (dot) com for more information.